I spot a 'Green' 5 Spot! 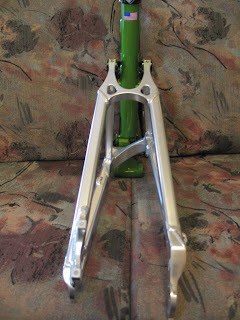 The new bike frame showed last night! I'll have most of the other parts soon, and can begin putting it together shortly! "Fragile.. Must Be Italian?" Nope.. made in the USA! 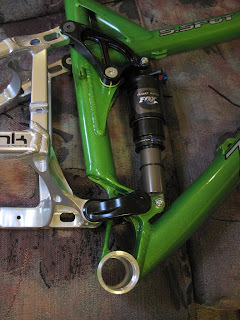 I tried to get all the differing angles so you could see the latest 'state of the art' in rear suspension Mtb. design. The key is the 'DW' link which is really simple at first glance, almost one of those.. 'why didnt I think of that' sort of things. 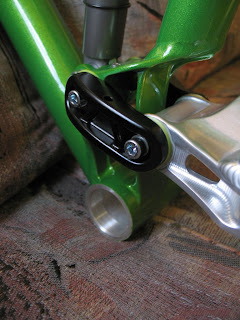 In reality, it does wonders for reducing the amount of 'pedal bob' (where the rear end flexes, while pedaling the bike uphill?) 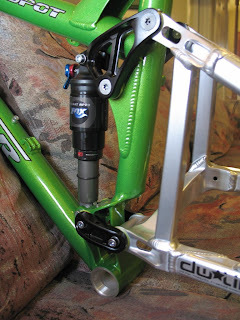 This means, less wasted energy in moving the rear shock up and down, and more power transmitted to the back wheel. 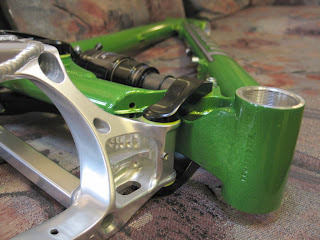 If you head over to the USTPO (US Trade and Patent Office Patent) you can check out the technical info and also read all the gory details here as well :) The guy that came up with this has licensed the design to several bike mfgs, Turner Bikes being one of them. 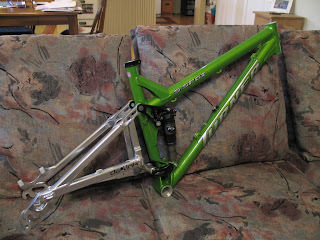 I've ridden many different bikes and designs from a dozen or so mfgs. This was the first one, that really blew me away as far as pedalability uphill, and plushness on the downhills! 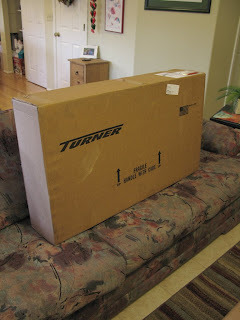 Thanks to my SNPS coworker Shaun Evans for introducing me to Turner bikes on our weekly rides last year in San Diego! nice you are going to like it - i think i had the light go on during my last Pass mtn. ride as to what the DW link really is all about, and i am a true believer from my 40 minute spin on a Sulatan. you flow over things, instead of doink-then-claw over things. Enjoy! 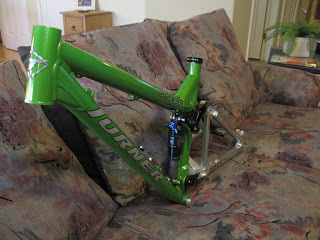 Let me know the gory details my bro is in the market for a nice AM bike.